2018 was an exceptionally fun and busy year for Tam Makers, the community makerspace which Geo Monley and I co-founded a couple years ago! We welcomed new teachers, including our first student teacher. We created an award-winning art float for social change with over a hundred volunteers. We started a teen maker club and other activities for high school students. Our community members amazed us with cool new projects. 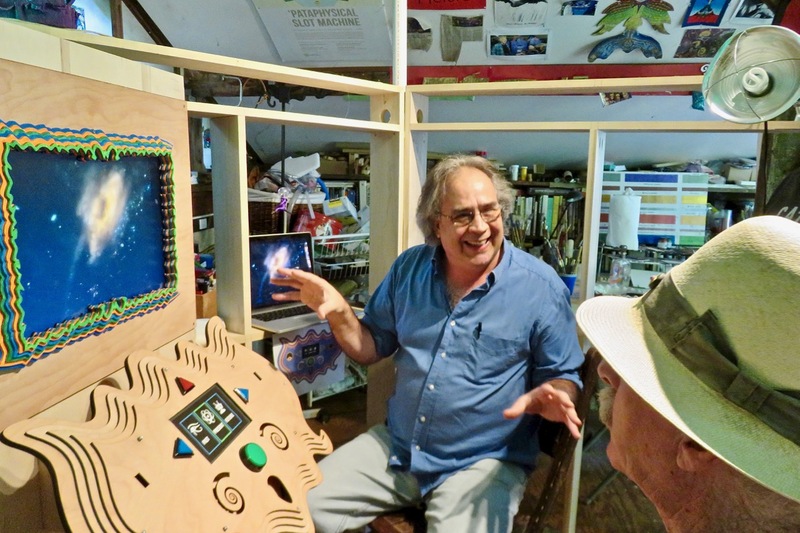 Here are just a few highlights of what happened this year at Tam Makers, with photos and shout-outs to community members who made them happen. If you live in the Bay Area and would like to join the fun, sign up for our new classes and workshops for adults and teens in 2019. We’d like to thank all of our community members who made Tam Makers so special this past year! Your energy keeps our shop alive with activity and it brings us great joy to work and play with all of you. Happy New Year! 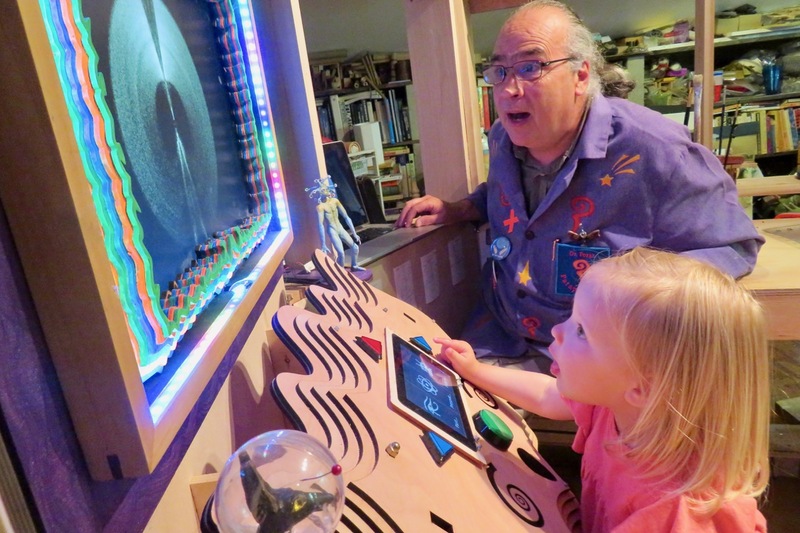 Several of our community makers took on new roles as regular instructors at Tam Makers. Furniture maker Pierina Dell’Avo led our You Can Build It workshops. 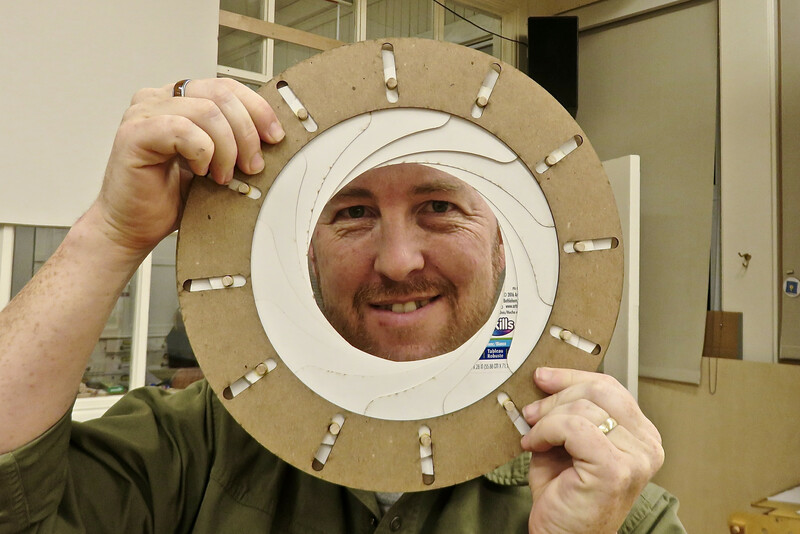 Creative director Chris Krueger taught CNC Router classes at Tam Makers and made many improvements to our makerspace this year. To learn more about our teachers, visit our Community page — or just sign up for their classes. A group of volunteers organized by Julia Dorn built this picnic table and benches, and set them up by Tam High School’s music building. This was just one of the community projects that took place at Tam Makers this year. See photos of our latest projects in our Tam Makers album. In spring 2018, we created an Art Float for Social Change, to inspire people to participate in democracy. This community art project was built by a team of over a hundred volunteers, led by Fabrice Florin and Geo Monley at Tam Makers. We are grateful to them all — and to Tam High School for hosting this project and presenting it at the student center on Earth Day. To see how we created this float, view our project slides and photo album, as well as this Independent Journal article. This spring, the Tam shop acquired new equipment for machining metal and plastic. Students used these Sherline milling machines and lathes to make a variety of parts, such as marble mazes and these handmade joints for our Art Float. See more photos in our Tam Makers album. The Art Float for Social Change made its debut at the Memorial Day Parade in Mill Valley. Our unique parade float featured Mother Earth and a circle of waving hands, spinning on a carousel of art pulled by a giant feathered serpent. Dozens of volunteers marched with us and our partners at Good Earth, MVCAN, Pataphysical Studios and the Youth Poster Contest. We received the Best Community Spirit Award for this collective art project, which invited people to vote and create a better world! To see the Art Float in action, watch this video and event photos. Tam High students created a variety of cool projects this year at Tam Makers, under the guidance of Geo Monley. Rebecca designed a beautiful bowl on Adobe Illustrator and cut it out on the laser cutter. Will designed and built this practical desk out of incense cedar and epoxy resin. To learn how to create projects like these, sign up for one of our classes for adults and teens. People loved our Art Float at the Fourth of July Parade! We strolled down the streets of Larkspur and Corte Madera, showing off our giant earth and dragon of change to inspire thousands of spectators. Tam High student Emma Spike and the Freedom Singers performed classic protest songs on our float podium. Folks sang along, cheered us and responded to our call to “vote, speak up — and be the change!” See more parade pictures in this Art Float media page and in this photo album. To plan our next steps for Tam Makers, our core team held a retrospective this summer, with Chris Krueger, Fabrice Florin, Geo Monley and Meryl Rubinstein (shown from left to right on the photo above). 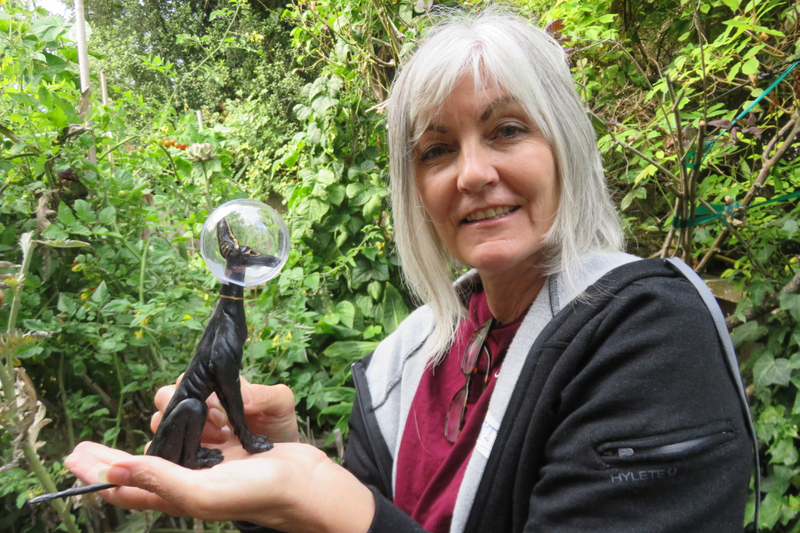 They are holding the First Prize trophy we won for our Art Float at this year’s Fourth of July Parade in Corte Madera. Tam High student Niles Wertz became our first teenage instructor this fall, with his ‘Introduction to Wood Turning’ class. An experienced wood turner, he showed adults how to make objects such as wooden pens, mallets, candlesticks, spinning tops, and bowls. 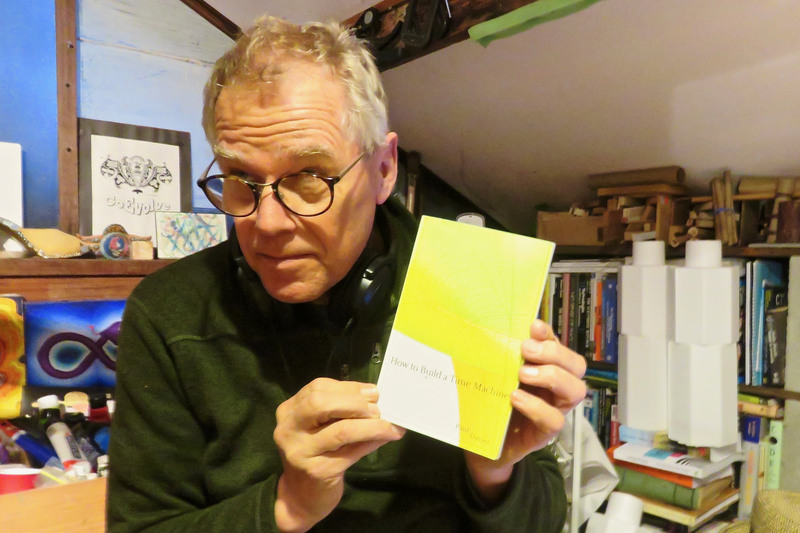 He sells his own creations at local arts and craft shows, such as the Mill Valley Fall Arts show, where the photo above was taken. This fall, we started the Teen Maker Club, a new weekly afternoon workshop for students ages 12 – 17. As a result, many young makers have started to use the shop to create their own projects after school. They get to learn laser cutting, 3D printing, electronics, robotics, woodworking and more in activities supervised by Tam Makers director Geo Monley. 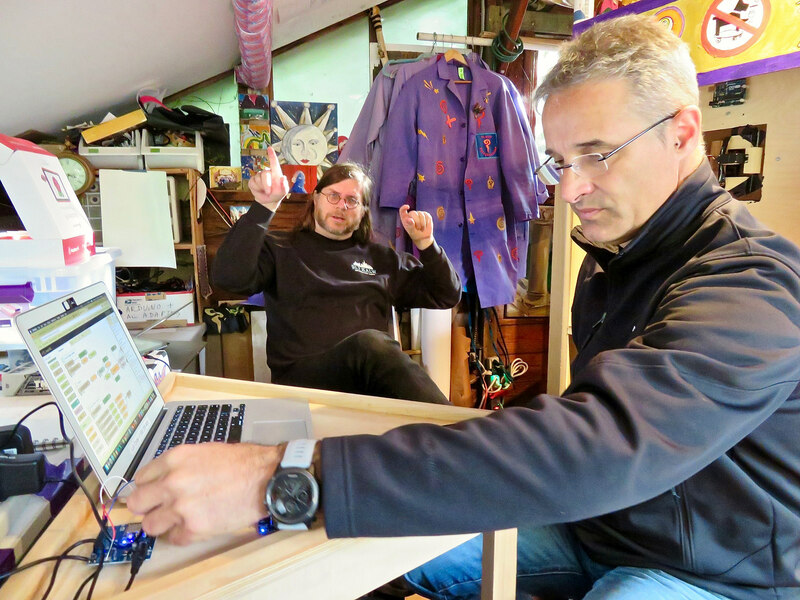 Last November, we led a fun workshop on how to create automata — or kinetic sculptures. 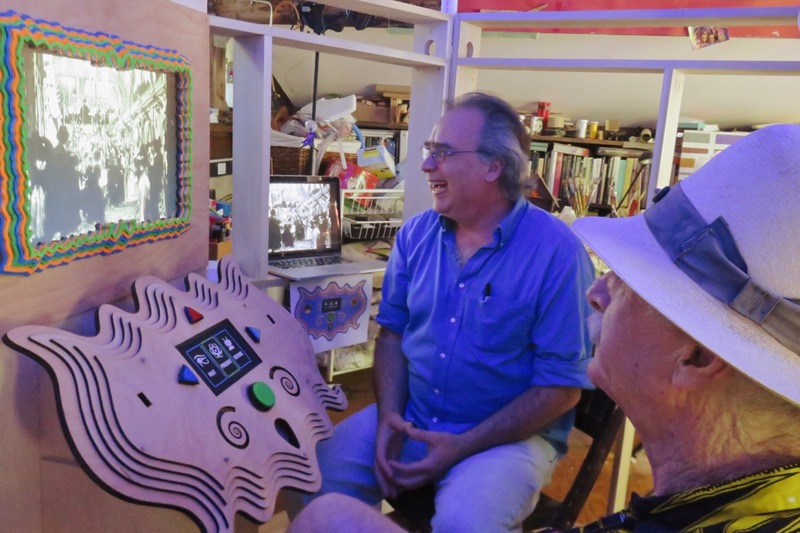 Geo Monley hosted a group of North Bay Maker Educators, who learned how to make their automata move round-and-round, side-to-side or up-and-down. They designed their own animatronics, such as this animated cat, using bamboo sticks attached to foam cams, sliding through 3D-printed guides in their wooden boxes. 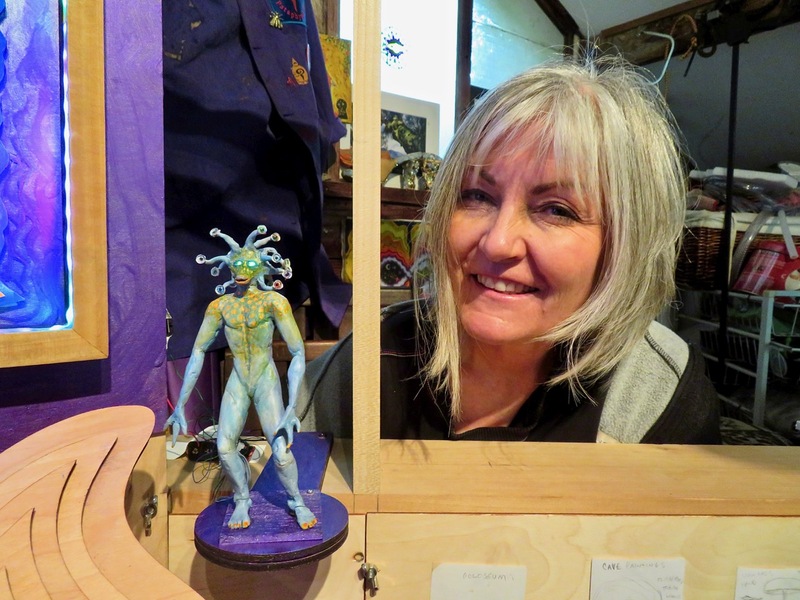 We hope Marin students will enjoy creating their own automata as much as their teachers did! See also our short video, photos and lesson plan. 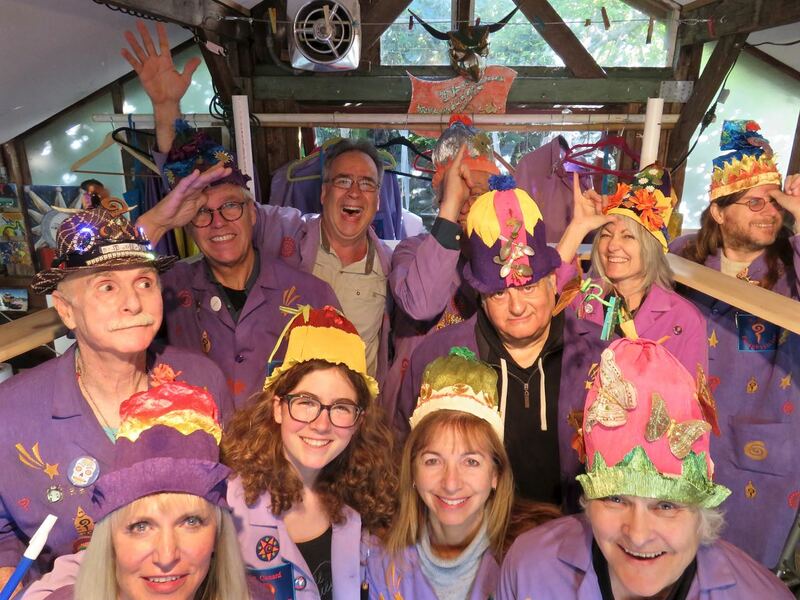 Meet some of the folks who make our Tam Makers community so special! The week before Christmas, a few of the regulars joined open shop sessions to build projects that made us happy. For us, the best holiday gift of all was the act of creation, in the company of like minds. We’re a community of makers and artists who like to build things together and learn from each other. To meet some of our makers, visit our community page. To learn about our activities, visit our classes page. And to stay in touch, sign up for our newsletter. Happy New Year from all of us at Tam Makers! This page was created by Fabrice Florin and originally published here on the Tam Makers site. 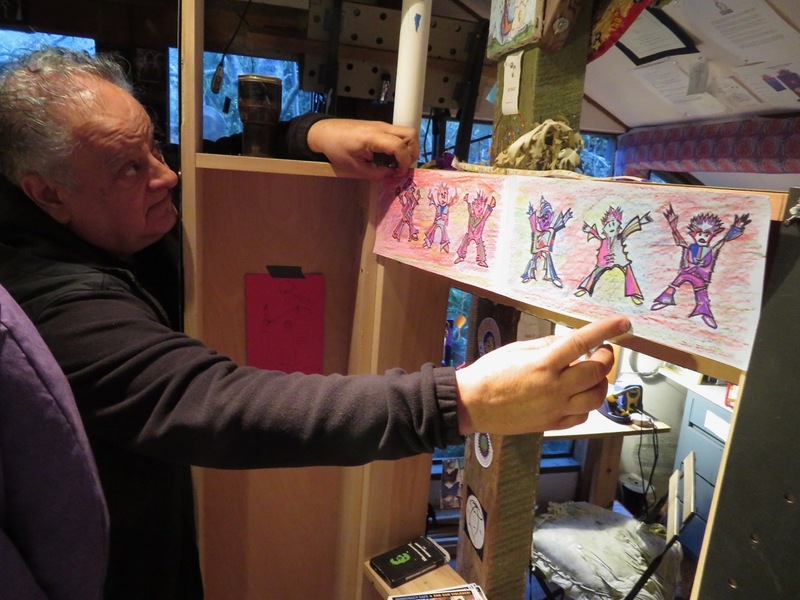 This entry was posted in Art, Community, Learning, Maker, Tech and tagged 2018, art float, Automata, community, education, maker, maker art, Maker Club, makerspace, marin, meeting, mill valley, school, tam high school, tam makers, Teacher, tech, workshop, youth on January 12, 2019 by Fabrice Florin. 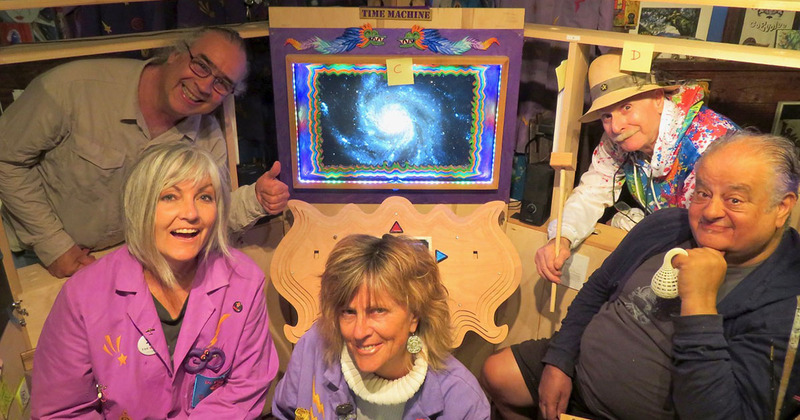 We are creating a Time Machine at ‘Pataphysical Studios, our art collective in Mill Valley, where surrealism meets the maker culture. 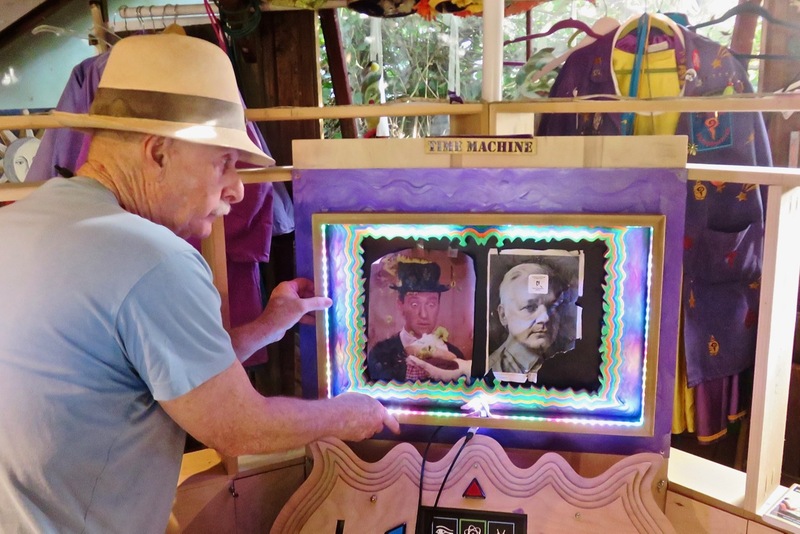 The ‘Pataphysical Time Machine invites you to travel through time and meet characters from the past, present and future. We hope to engage our guests in a fun interactive experience that combines art, multimedia, theater and technology. This 3D fly through video illustrates the experience we are creating. 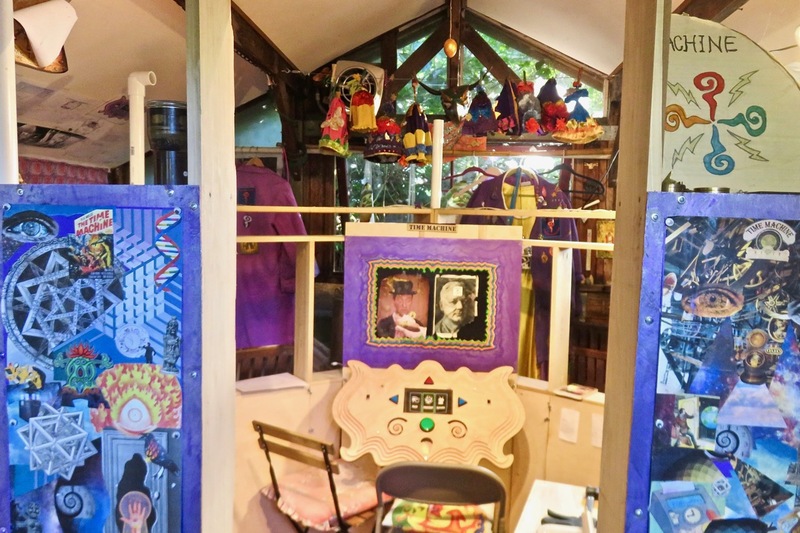 We invite our guests to go through a short interactive ritual during their visit: walk around the exhibit, step into our magic portal, pick a time to visit, travel to that time, meet its characters and return back to the present. Press the buttons on this time travel dashboard to jump to different periods, which are shown on the illuminated screen above. Our Time Machine exhibit is inspired by steampunk and art movements from the early 20th century: Pataphysics, dada and surrealism. … and many more time travel artifacts! To see our work in progress, view photos below, and our photo album for the Time Machine. To learn about other artifacts, visit our exhibit design spec for the physical structures. 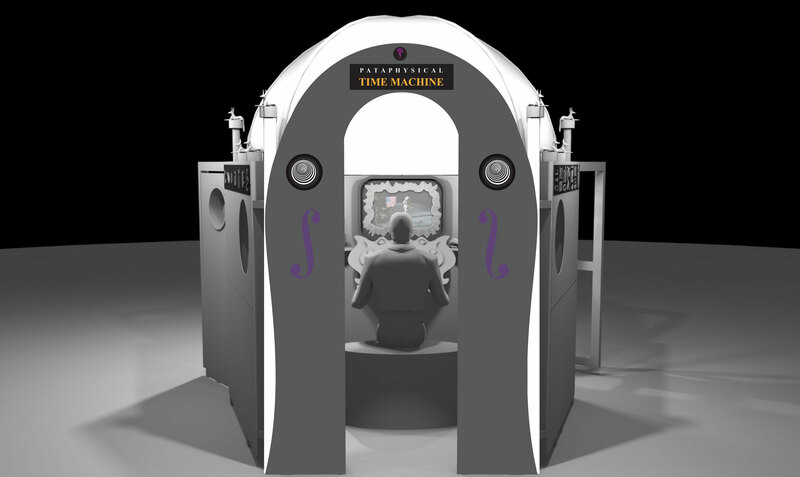 To learn more about the interactive experience, read our time travel design spec. 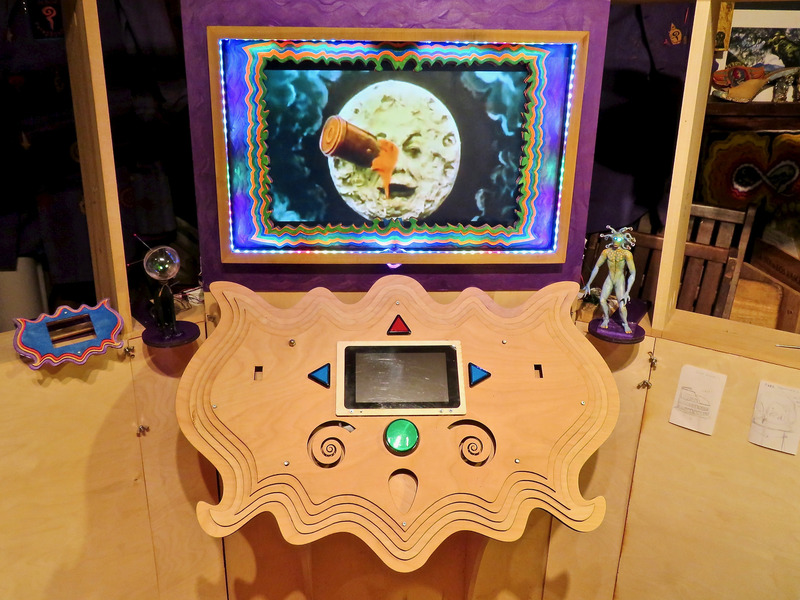 If you liked our ‘Pataphysical Slot Machine, we think this new art exhibit will transport you even further. Fire in the hole! Animated figures of the ancient god Anubis and the Creature from the Future Lagoon are here to guide your journey through time. 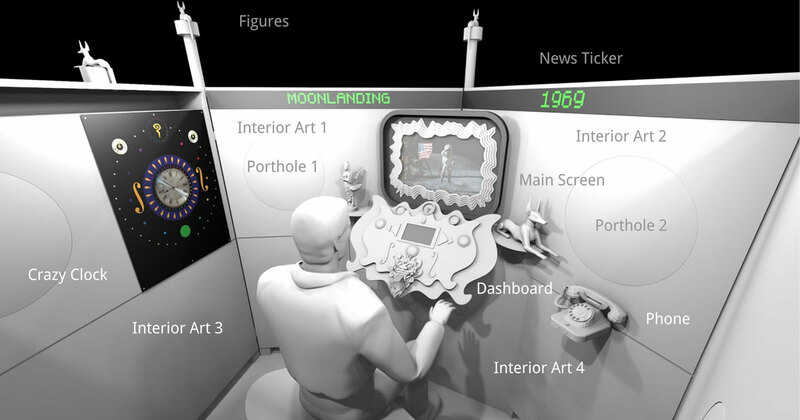 To make our art come to life, we are now developing new media and technologies that will animate the exhibit with animated characters, lights, sounds, motion and videos of the different times you will travel to. Our growing video library already includes dozens of short clips for different time periods, to create the illusion of time travel. This Belle Époque video takes you back in time to Paris at the start of the 20th century, when the arts and sciences flourished, along with a “joie de vivre” (joy of living) that is music to our ears. This short video is just one of the scenes you can visit with the Time Machine, and its authenticity is confirmed by copious historical footage from a variety of sources. 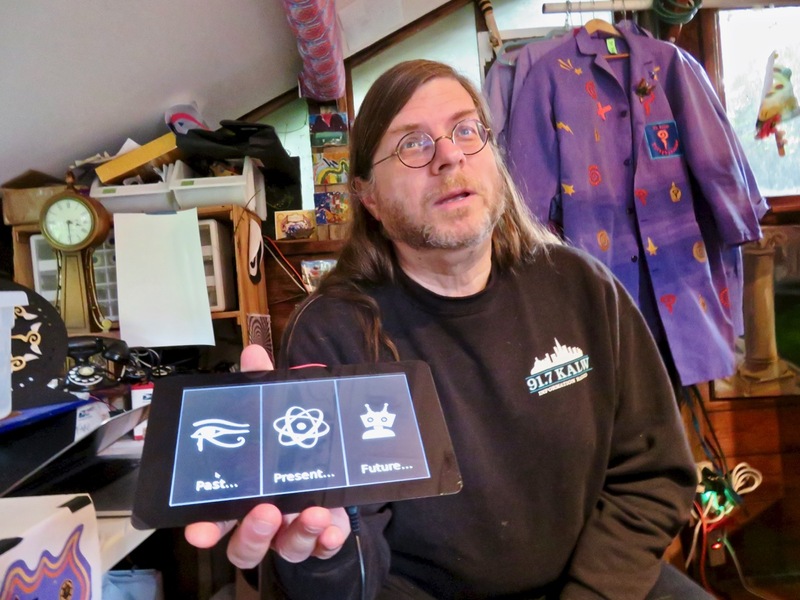 Other scenes in our prototype include videos of the Big Bang, Dinosaurs, Ancient Egypt, the French Revolution, A Trip to the Moon, Dada Cafe Voltaire, Trumpocalypse — and many more. Here are some of the other time scenes we‘re considering for the next version. Meanwhile, our sounds library now includes many time travel soundtracks, as well as musical quotes about time (e.g. “Time!” by the Chambers Brothers, “Crying Time” by Ray Charles, etc.). To learn about our multimedia plans, visit this media overview. We will combine many different digital technologies to support the Time Machine experience: Arduino and Raspberry Pi for artifact devices, NodeRed for the central host, MQTT for the messaging protocol, EasyESP firmware and other tech. Learn more in this infrastructure document, programming guide and technology overview. About a dozen creators are building the Time Machine together. We’re artists, engineers, makers, performers, poets, organizers and multimedia innovators. Over the years, we have grown into a world-class troupe of interactive artists, who like to make things together and learn from each other. Most of us are members of Pataphysical Studios and listed in this community page. We work in small creative teams to design and build the different parts of the Time Machine, combining interactive art with lights, sounds, motion, and videos of different times. Besides Pataphysical Studios, some of our fabrication work takes place at at Tam Makers, our community makerspace in Mill Valley, where we use a wide range of tools, from laser cutters to CNC routers and milling equipment. Learn more on our planning page and project lists. This is the most complex art project that our team has taken on, and we could use more help. We are now recruiting a few more creators to contribute to our community project, so we can complete it together in coming years. If you would like to help build this interactive art experience with us, email us at info@pataphysics.us. We’re particularly interested in collaborators who you live in the Bay Area and can join our weekly work sessions in Mill Valley on Saturday afternoons. But if you live outside the Bay Area, we can also collaborate on a variety of tech and media projects. Let’s talk! It’s a true pleasure to help new teams come together to design and build the various parts of our Time Machine. That’s what collective art is about. We can’t wait to see what it will look like in a year! For more project updates, we invite you to subscribe to our mailing list — and/or follow us on Facebook. Learn more at pataphysics.us. We hope to see you soon, online or in person. To see more photos of our work in progress, visit our photo album for the Time Machine. This page was republished from our Pataphysical Studios site. This entry was posted in Art, Community, Maker, Tech, Theater and tagged arduino, Art, character, collage, doctor, electronics, exhibit, fabio, figurine, machine, maker, maker art, makerspace, marin, mill valley, Multimedia, pataphysical, Pataphysics, raspberry pi, rindbrain, studio, tech, time, time machine, time travel on September 17, 2018 by Fabrice Florin.